In recent years the development of the Russian Navy has been hampered by conflicts between military commanders and industry heads, and also by personal interference. It is likely that the resignation of Anatoly Serdyukov as Defence Minister will prompt Russia's naval forces to implement long-standing plans of the country's military and political leaders. The fact is that in recent years the development of the Russian Navy has been hampered by conflicts between military commanders and industry heads, and also by the personal interference of the Defence Minister himself. Striking confirmation of this is the national aircraft carrier construction programme. A few days before Serdyukov's departure as defence minister, Navy Commander Viktor Chirkov clearly expressed the global challenges facing his fleet. “The overall objective by 2030 is to ensure that the Russian Navy is able to secure the national interests of the Russian Federation at sea at anywhere in the world and to guarantee the county's strategic nuclear and non-nuclear deterrence,” Chirkov said at a meeting of military attaches in Moscow. The last two or three years have seen significant changes in the role and position of the naval chiefs of staff in the general management of Russia's Armed Forces and within the Navy itself says Chirkov. He noted that the Armed Forces had moved from a system of separate service branches, each with its own set of tasks, to the formation and deployment of common troops under one command across all theatres. “The Russian Ministry of Defence is continuing to optimise the command structure,” Chirkov said. What conclusions can be drawn? Some fairly concrete ones. Most importantly, these days the only way to guarantee strategic objectives in a combat theatre is through the deployment of aircraft carriers, more specifically carrier strike groups (CSG). Only aircraft carriers, which combine the three branches of the Armed Forces (marine, air, and ground), are capable of conducting operations in close cooperation with other units and formations. In today's unpredictable world, the mere appearance of a fully armed battleship off the coast of some ‘hot spot’ can have a sobering effect on a potential aggressor. The capability of rapid CSG deployment is a tool of political influence that Russia can use in peacetime. Plans to construct more aircraft carriers were officially announced by the naval chiefs of staff a year ago. The first ship is due to be commissioned by the middle of next decade as part of a comprehensive programme to modernise the Russian Navy as the main military priority through 2020. Before that, in mid-2011, the head of United Shipbuilding Corporation (USC) Roman Trotsenko told reporters that 2016 would see work begin on the design of a next-generation nuclear aircraft carrier, and construction could get underway as early as 2018. In just five years, the carrier could become part of the existing fleet. Besides the aircraft carrier, a new line of destroyer escorts will also be built. In other words, the plan is to acquire a fully operational CSG. However, the Ministry of Defence has denied ordering the hypothetical carrier. “R&D work is currently being carried out, but until the results of have been presented, there can be no talk whatsoever of ordering such a carrier,” said then Defence Minister Anatoly Serdyukov. A strange and somewhat contradictory position, to put it mildly! Any delay in establishing a modern fleet of aircraft carriers could harm Russia's commercial interests and be detrimental to the country's scientific and technological capacity. It is no secret that Russia recently sold two heavy aviation cruisers: the Admiral Gorshkov to India, and the Varyag to China. 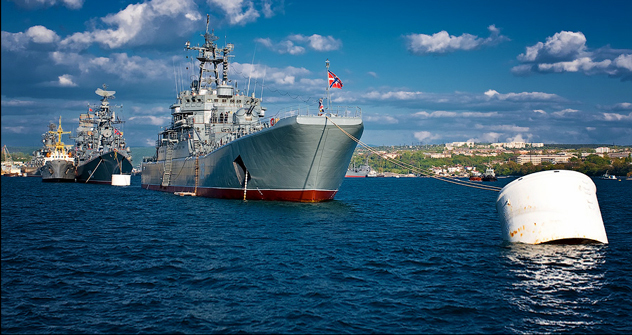 Both ships were built at the Black Sea Shipyard in Nikolayev, Ukraine under the same 1143th project with a six-year gap. Upgrades were subsequently made to the Gorshkov at Russia's Sevmash plant, and to the Varyag at China's Dalian Shipyard. Meanwhile, the head of the State Duma Defence Committee and former commander of the Black Sea Fleet Admiral Vladimir Komoyedov believes that the technological groundwork accumulated in the USSR could be lost. “We are not building any more aircraft carriers. We hear only declarations, while the start date varies wildly from 2015 to 2030, by which time those who upgraded the Vikramaditya (India's name for the Admiral Gorshkov) may no longer be at Sevmash,” he said. Nevertheless, USC spokesman Alexei Kravchenko believes that the Vikramaditya project has shown that Russia retains an engineering school capable of building aircraft carriers; the problem is the lack of political will. “The Ministry of Defence has yet to issue clear guidelines regarding deadline, budget, and number of vessels,” he complained. Perhaps the new Defence Minister will be more succinct in his pronouncements.